We’re not sure we’ve ever seen an England side as bad as this. The top order keep throwing their wickets away. The bowling lacks pace and guile. There’s no plan. No cohesion. Midway through England’s innings we actually threw up due to acute dissatisfaction. We now feel completely irritated. COMPLETELY IRRITATED! You hear that, England? That’s what you’re doing to your loyal fans who’ve stuck with you through thick and thick this winter. You’re making them feel completely irritated. Is there a worse sensation than feeling completely irritated? Yes, there’s feeling completely irritated shortly after throwing up due to acute dissatisfaction. Ian Bell for England – good or bad? I think this win demonstrates that Australian cricket is not completely and utterly bereft of talent at batting, bowling and fielding. There is definitely a small kernel of talent at the heart of Australian cricket – small, some would say invisible to the naked eye, but real nonetheless. They can build on this success now, and like Bangladesh before them can use this win to improve in all formats of the game. Yes. Triumph or Disaster there can be no shades of grey. I am quite frankly disgusted that I allowed this England team to distract me for several hours this morning when I could have been doing something less productive like working. What can we do to counter this alarming new Australian dominance? Which selectors should be sacked? In many ways the seeds of this defeat were sown when Andrew Strauss and Andy Flower took charge in the Caribbean in 2009. It seems to me that Collingwood is a workmanlike captain for the T20 side and unfortunately, with such lack of class comes complacency. And mediocrity. Eight straight wins is a really mediocre world record and (mark my words and remember where you read it first) that record will be beaten in the fullness of time. Surely the time has come for Captain Cook or perhaps even General Strauss to assume his birthright and captain the T20 side back from this terrible slump. one boundary in the innings, hit by chris woakes in the final over. 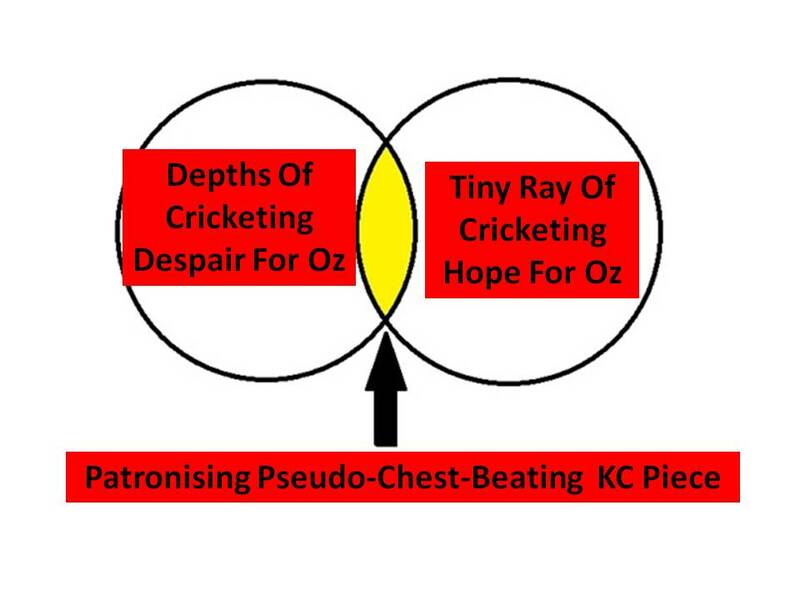 i think we need to call for a root and branch review of english cricket. Bert – pushing the boundaries of tempting fate. I applaud. Everyone else – it’s not all bad, I can’t help but feel you’re giving in to hyperbole a little. I have been sent links to lots of ashes t-shirts lately. I can’t help thinking that none would be better than these two on a shirt. 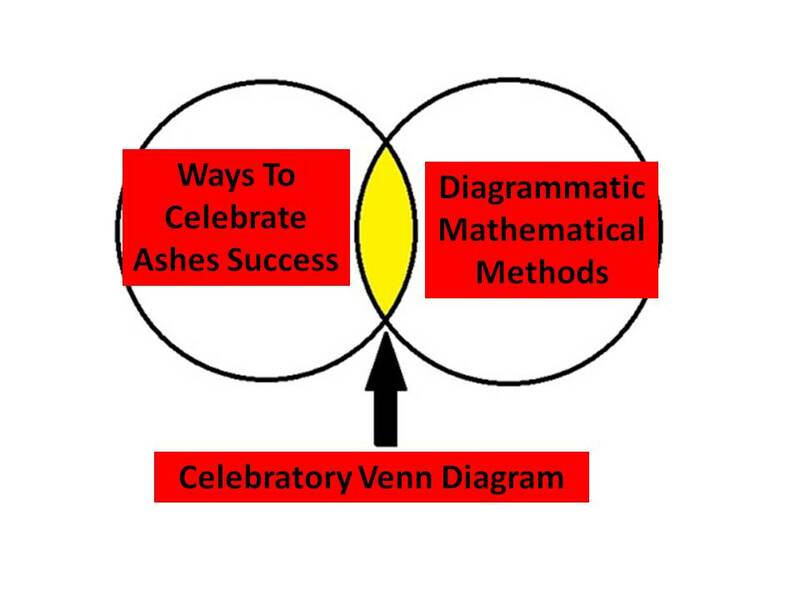 Hmm, I can’t find the Ashes Celebratory Venn. That anyway. I want t-shirts of those two. Absolutely everyone would surely think I was cool wearing those. KC – make it happen. Oh stuff it, you’ve won the Ashes haven’t you? You English fans don’t know how to appreciate what you’ve got. I think we ARE appreciating what we’ve got, we’re just doing it in our own inimitable style, Marzipan_Alex. I give up on the England cricket team. And for this bunch of jokers they continue to ignore Mark Ramprakash. Welcome to the Indian problem. What were England thinking of, dropping Colly for the first ODI. England need his workmanlike skills at a time like this. People who make the most of their limited talents, that’s what England needs. Colly should have been skipper, never mind dropped. The victory just goes to show how much talent there is in the Australia team, and underlines what a great performance the tests were. To those who asked were England great or Australia appaling, then look at how great they can be when we let them.